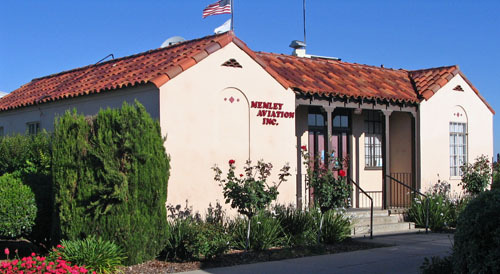 This Spanish Revival-style building is one story and has a shallow H plan. The building is frame construction with stucco exterior. The shallow cross-gabled roof is sheathed in tiles. The front entrance is now a glass door with a five-light transom and side lights. The door is flanked by matching steel casement windows. The porch and entrance are inset and the shed roof of tiles is supported by wooden posts with carved capitals. The front and back elevations of the front gabled wings were originally identical: thus with a casement window with fixed lights above and decorative tiles inset above the piercing. The window on the southeast corner, however, has been in-filled. There are three additional casement windows along the west elevation of the building, and a solid panel door at the northwest corner. There appears to be a shallow bay window on the north elevation that is difficult to see as it faces onto the runway, which is restricted.